Can a plant-based patty deliver all the flame-grilled, juicy craveability of the revered BURGER KING® restaurants WHOPPER® sandwich? We think so, but can you really believe anything you hear on April Fools’ Day? In a new video, BURGER KING® restaurants surprised its loyalguests by serving the Impossible™ WHOPPER® instead of the classic WHOPPER® -- and filmed their reactions. Watch the Impossible™WHOPPER® film at www.YouTube.com/BurgerKing. Starting today, 59 exclusive BURGER KING® restaurants in and around St. Louis will be testing the Impossible™ WHOPPER® -- a flame-grilled, plant-based patty topped with freshly sliced tomatoes, fresh lettuce, creamy mayonnaise, ketchup, crunchy pickles, and sliced white onions on a toasted sesame seed bun. The Impossible™WHOPPER® is, “All WHOPPER®. No beef.” It’s as juicy, craveable and delicious as the original WHOPPER®. 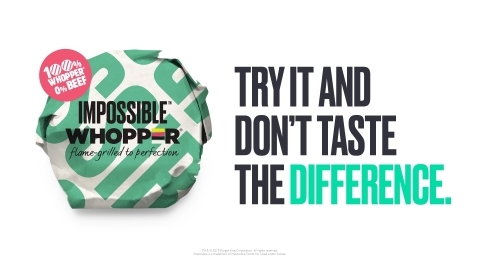 The limited-time offer makes BURGER KING® restaurants the first coast-to-coast quick-service restaurant to serve the award-winning, plant-based meat from food startup Impossible Foods, maker of the Impossible™ Burger.